WDAMI offers awards at every level in Western Dressage. This is a huge benefit of becoming a member of the WDAMI. Beautiful, usable items, ribbons, and silver belt buckles; you want to participate in this program! WDAMI presents awards at its annual membership banquet. Keep your test scores, make copies of front and back pages, and follow the PROGRAM RULES to be eligible for WDAMI Year End Awards. Print the RIDER REPORT FORM to keep track of your scores. Board Approved March 21, 2019. Effective March 22, 2019. • Membership is effective the day the correct application and payment is received. Open – Open to all members. There is no age restriction. Adult Amateur – Members are eligible as Adult Amateurs beginning with the competition year in which they turn 18 years of age provided they are not involved in activities cited in USE Rule GR1306 which would render them to be professionals. Junior – Individuals are eligible as Juniors until the end of the competition year (ends on Oct. 31) in which they reach the age of 18 (USE WD102.3a). If the rider’s birthday is November 1, assume the greater year. Please provide WDAMI date of birth (DOB) on membership & on Rider Report Form. Note – Adult Amateur and Junior divisions are separate divisions and are mutually exclusive. There can be no crossover between the two. Scores may be from any schooling show held in Michigan which is open to all riders and horse breeds. All tests must be current USE/WD tests. Tests may be found on the WDAA or USE websites. Tests shall be ridden per WDAA & USE rules. Only two consecutive levels for one horse/rider combination will be awarded in a competition year. Each test score can only be used once toward a division championship. The show year for WDAMI awards will be November 1 through October 31. Awards will be presented at an Awards Banquet or mailed to the recipient no later than January following the end of the show season. • Awards are given on an individual horse/rider basis. A rider may submit scores from tests ridden on more than one horse, however, each horse/rider combination must individually meet all award requirements and be submitted on separate Rider Report Forms. • Must be from a schooling show held in Michigan that is open to all breeds of horses. 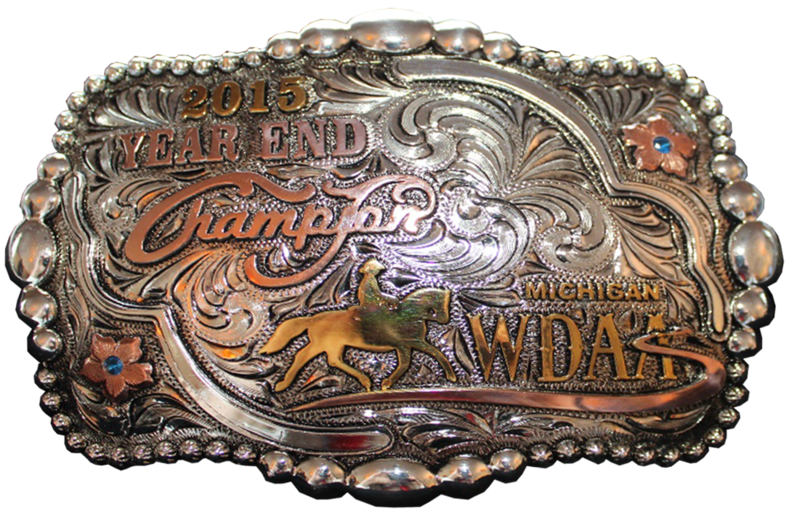 Recognized USE/WD competition show scores may not be used for schooling show year-end awards and certificates. • Scores on each Rider Report Form must come from one rider/horse combination. • One of the five scores submitted must come from the highest test of that level (Test 4). • Scores must come from judges who are USDF “L–grad” or USE “r”, “R”, “S” or FEI judge or a USE Western Dressage “r” or “R” judge. • Hors De Concours ride scores will not count towards year end awards or certificates. • Will be available for printing from the WDAMI website: www.wdami.org. postmarked no later than November 15, to the name and address stated on the Rider Report Form. • Must include copies of the front and back of the tests and make sure judge’s name and signature are included on the test. • Include copies of WDAMI and WDAA membership cards to assist with membership verification. • Separate forms are required for each rider/horse combination and for each level/division. • Separate forms for awards are required for Year End Schooling Show Championship, Freestyle, Gaited Horses, Ponies, Mules, and Highest Percentage Individual Ride Award. WDAMI is not responsible for incorrect forms or show results. Incorrect forms may not be considered. This award has been developed to reward your commitment to using and enjoying your horse(s), pony(s) and/or mule(s). Pleasure, conditioning, training, riding lessons or doing groundwork all count. You can work with more than one horse, pony and/or mule to accumulate hours. There is no time limit for completion of the award levels. November 15 of the competition year. The hours you submit are recorded by you on an honor system. You will receive an Achievement Award at our Annual Banquet and Awards Presentation. Open to all divisions, breeds, and levels. The highest percentage individual score from each test (1 through 4) at each level (Introductory through Level 4) will be awarded a ribbon. Even if you do not have enough scores for other WDAMI Awards, you may qualify for this award. Complete a Rider Report Form and submit a copy of the front and back of your test. This award is open to all and combines ponies, mules, horses and gaited horses into one championship. certificate. To be eligible for consideration for this award, you must submit three scores coming from at least two different judges. Include copies of the front and back of the tests and make sure the judge’s name and signature are included on the test. Submit a Rider Report Form marked “Freestyle” and include copies of the 3 tests. stated can serve as proof of height. Championships are calculated by taking an average of the scores submitted. Ties for champions and reserve champion will not be broken. For placings 3rd – 6th there will be no ties; ties will be broken by removing the lowest score and re-averaging. If all scores are identical, the ties will be maintained. • Rescue Horse Certificate of Honor. Proof of adoption must be submitted with the Rider Report Form and may be in the form of a copy of the adoption papers, adoption certificate or something similar. • Three (3) scores of 55% or highest in the declared level/division. • Scores must be from three different judges and from three different schooling shows. • One (1) of the scores must be from the highest test of the level. process, awards decisions, membership, rules, and any other decision regarding WDAMI. are reviewed and updated at the end of the show year. Updates will be posted on the Western Dressage Association® of Michigan website: www.wdami.org. WDAMI supports the use of tested and approved (ASTM/SEI) helmets. The decision to not use an approved helmet is solely the responsibility of the individuals in the event which they decide to participate.